There is a treasure chest of ‘sweetened water’ and diet beverage products out there, and in my opinion most fall short. After the artificial sweeteners or added sugar and additives, it feels like you’re drinking fake water. I recognize that many people have a hard time drinking sufficient water on a regular basis, and adding fruit flavor to it becomes a greater motivator to drink water. But shouldn't the product you choose be as wholesome as it’s main ingredient, the actual water? Well there is a relatively new product on the market which seems to answer that question with a resounding YES. Sparkling Essence by R.W Knudsen, an organic juice company, provides carbonated spring water with a hint of real organic fruit. There are no added sugars, additives or preservatives and no calories. Plus the product is Certified Organic. They use a process of brewing the organic fruits into fresh spring water. It is a great alternative to regular diet beverages and can be consumed in place of juices. It’s also great for people who want ‘real food’ options when it comes to weight management. The flavors include Mint, Cucumber, Blueberry, and Lemon and is best when chilled. The suggested price is $3.79-3.99 for a 4-pack container. 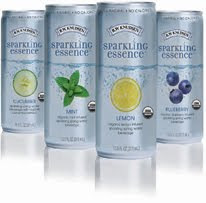 You can check out the company's site for stores which carry Sparkling Essence.